How to turn a blank sheet of paper into a superbike in eight steps. Well, as you will soon see, that’s easier said than done – especially when you start from scratch, with a little more than plain paper and board. But Atamjeet Singh Bawa of New Delhi, India, displays a keen eye and a remarkable sense of scale model profiling – something that could get the original designers to drop a jaw and take a closer look. 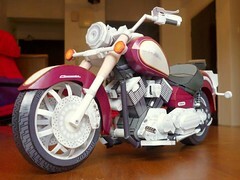 His range of paper-crafted models includes warheads, space shuttles, fighter planes, warships, motorbikes, and more. The largest model crafted by Atamjeet is the M4-A Pulse Rifle – made to a scale of 1:1 and three feet long. He has also worked on a 1:1 model of a rocket propelled grenade launcher – roughly four feet long. His smallest creation is a 1:48 scale model of the Bell XP-77 Airplane – barely five inches long from nose to tail. Currently Atamjeet works as a software programmer with an IT firm. He says he loves coding, so there’s no problem with that during working hours. His eyes light up, I guess when it’s time to clock off at work and get home – when he can get his hands dirty with glue and paper. Q: Atamjeet, how did you pick paper as a medium? Paper gives me the convenience of ‘doing something from flat’. Look at it another way – paper is also the cheapest and most easily sourced raw stock you can lay your hands on. If I want to make changes, I just take another printout and take things forward. Paper also enables a remarkable sense of detailing – making it easier to cut, curve, crease and fold. While paper art is largely known for origami, I have attempted to give the medium a whole new dimension. Q: What is a typical start-to-finish process? It basically takes seven to eight steps to take my projects from concept to creation – let me try and outline the process for you. Stage 01: I start with researching my target original for a few days – this includes time spent on looking up product history and understanding design interventions. Stage 02: Initial 3D renderings of the model on my computer – giving me different viewpoints of approach – this is where I visualize scaling down in terms of form and function. Stage 03: I obtain a preliminary printout to serve as a planner – this has detailed notes on colors, graphics, paper grades, margins and assembly. Stage 04 is when I do the detailing of surface graphics, background colors and cutting guidelines. I usually do a few trial print runs here to see how the image prints out on different grades of paper. Stage 05: This stage can be tedious and labor intensive. Once the printing is done, each component is individually cut out like a jig saw puzzle – I usually end up with an assortment of small to large pieces. Stage 06 is a validation of the first five stages – to correct the smallest deviations and ensure accuracy in terms of fitment, assembly and form integration. Stage 07 – This is where I bend, crease, curve and fold to actually form each component and part assembly, based on original profile guidelines. I also do a soft assembly without glue, to see if there’s a perfect match in terms of interlocking and fitment. Stage 08: The finally assembly includes a careful step-by-step gluing sequence. This can be tricky, as I have to apply glue spots only on areas that I have pre-identified. After stage 08, the model still needs to be tweaked, in terms of last minute propping up in terms of alignments. I also need to do cosmetic retouching to mask the white edges visible when you cut out sections from paper or board. This is done using high quality felt pens. Q: How do you choose your boards, and what cutters do you use? A: A lot of planning goes into choosing the right paper or board – extreme variations in thickness can result in some level of difficulty during assembly. Fortunately for me you can easily get the kind of paper and boards that I need, right here in India. My cutting tools are actually a growing collection and something I have handpicked over the years. This includes X-ACTO cutters, ergonomically balanced scissors, heavy-duty blades and wooden dowels. When it comes to glue, I like working with ‘Desi Fevicol’ – available in local markets. Fevicol is just right, because it is virtually colorless and gives me enough time to pull, tweak and align before it dries. Q: How do you achieve that amazing degree of realism in form, detailing, graphics and paintwork? A: I work with a 6-P guideline that encapsulates Passion, Patience, Practice, Preparation, Perfection and Precision. These are my frames of reference and points of inspiration – whatever I may be doing – playing the guitar, playing ping pong, software coding, or working in my model studio. This level of discipline can be useful, because there are times when you can get tired and want to give up – 6-P helps me go that one level higher in terms of perseverance. Q: What dreams do you have to take this wonderful talent to new heights? A: I dream of a Madame Tussauds kind of a museum where all my models could be displayed with a historical timeline. Take the evolution of a bicycle for instance, which I do have in mind as a project. I also dream of working with automobile giants for product launch events that may call for model replicas using my techniques and talents. Just imagine, if Ferrari were launching a new model, I would love to see my paper creation of that car under the same spotlights. This talk by Atamjeet was given at a TEDx event using the TED conference format and independently organized by a local community.